Penn State cornerback John Reid, here answering questions during Media Day last year, is an intern for Intel. STATE COLLEGE, Pa. – John Reid is not at Penn State training camp and only James Franklin and the Nittany Lions' training and medical staff know for sure if the junior cornerback from St. Joseph's Prep will play this season after suffering a serious knee injury four months ago in spring practice. But Reid, who is spending his summer in Portland, Ore., as an intern for Intel, still is helping the Lions, Franklin said Saturday, by looking at video of training camp practices on his computer and texting cornerbacks coach Terry Smith with his observations. "John is going to have a huge impact for us this year. We'll see how it pAlays out, but either way, he's going to have a huge impact." Reid, who is a data sciences major, had the same internship opportunity last year but "just didn't feel comfortable making it work with his football responsibilities," Franklin said. "So he had accepted that internship this summer," he said. "Then based on, obviously, some of the challenges he has right now, he's able to stay and kind of maximize that opportunity. So we'll be really excited when he gets back because of his leadership and his knowledge." Reid started all 14 games for Penn State last season as the boundary corner and was named honorable-mention all-Big Ten. Franklin never has commented on the nature of Reid's injury, nor how long it will keep him out. After a productive spring, wide receiver Juwan Johnson appears to be in the mix to become a more productive member of the Penn State offense. But the way he looks at it, he would be happy contributing in any way, whether it's catching passes or playing on special teams, an area in which he finished second on the team with nine tackles last season. "Honestly if it's a receiver or if it's on special teams, just help the team in any way possible," said Johnson, a 6-foot-4, 227-pound redshirt sophomore from Glassboro High. "Wherever they need me at, I'm always going to be there. I just have to make plays when I'm on the field." Johnson, who caught two passes last year for 70 yards, likes the high-powered Penn State offense because "everyone gets a chance." "When the ball's in the air, you just make the most of your opportunity," he said. "Anybody can get the ball, anybody can make a play in this wide receiving corps, so I'm very excited for this season. I can't wait." 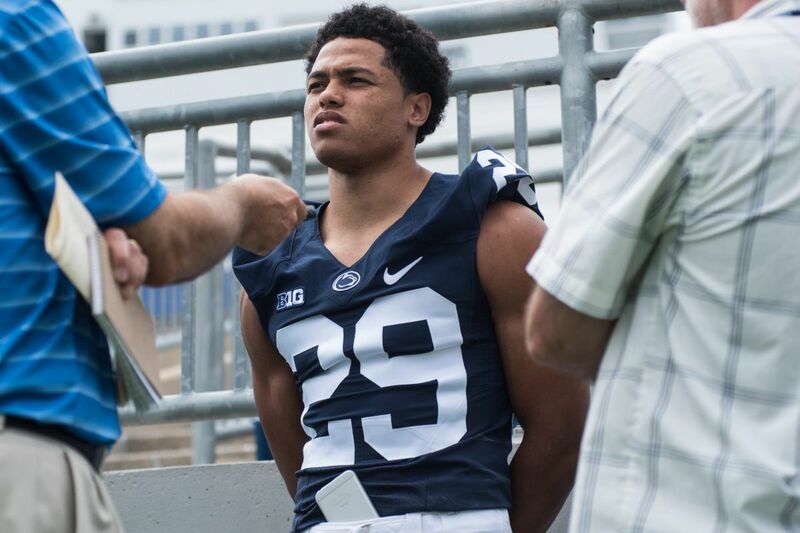 Franklin, who hasn't been shy about playing freshmen, said two newcomers who have been impressive are cornerback Tariq Castro-Fields and defensive end Yetur Gross-Matos. "Those two jump out right away," he said. "Don't get me wrong, there's a lot of guys, but these are the guys we're already saying are going to factor in. Over the next week or two, there's going to be other guys because we have no problem playing true freshmen. We encourage it."